In 2011, I rented a Piper Archer and flew solo across Australia to gain the required hours for my CPL. About a quarter of the way through my trip, I started to notice various types of aircraft that were, to my general aviation-trained eye, different. In Yarram, waiting for the clouds to dissipate before tangling with the Tasman VFR, I met a man with a funny looking aircraft (with numbers instead of letters), in which he had managed to store a bicycle. He, too, was intending to cross Bass Strait, albeit at 70 kt. I inquired about his strange craft and he informed me it was a Savannah and that he’d built it himself. Shuddering at the thought of flying in anything I’d had a hand in, I asked him a barrage of questions about its safety, and right there I learned, for the first time, about RA-Aus. In a fine example of the Baader-Meinhof phenomenon, suddenly I started seeing these numbered aircraft everywhere. Soon I began to spy a trend: in 2011, if you lived outside metropolitan Australia, and you were not crop dusting or bank running, the chances were you owned and operated an RA-Aus aircraft. I learned that these aircraft (Foxbats in particular, it seemed, but also Tecnams and Jabirus) were used everywhere outside the former general aviation aerodrome procedures (GAAP) airports, and their rental prices were almost half the amount I paid for a 1970s Beechcraft Skipper. And then, in April 2011, in another example of life’s peculiar narrative, I was offered a job as deputy editor at the RA-Aus magazine, Sport Pilot. To equip myself for this new role, I trained and qualified for an RA-Aus certificate, in the aircraft of my choosing. It was a different world. My club of choice was the Sydney Recreational Flying Club at The Oaks, south west of Sydney. Staffed by volunteer instructors, all of whom had the deadpan humour of air traffic controllers, the club offered a choice of a Foxbat and a Hughes Lightwing. My instructor, the magnificent Greg Davies, worked me through the paper work and informed me my conversion would take me a minimum of only five hours, with one hour solo. To fly in the RA-Aus category and to hold a current certificate, it’s mandatory to join RA-Aus ($210 each year). My training aircraft was as different from the general aviation (GA) Beech Skipper as a Nokia brick phone is from an iPhone 6: the basics were the same, but the engine, the avionics and the handling were so very different. The Foxbat has no flaps, just ‘flaperons’ and, as I discovered, finger brakes, which make so much sense. There is no mixture lever, and no carby heat—indeed no carby; the panel seemed bare, and at the same time more sophisticated. Fly a two-seat recreational registered aircraft in uncontrolled airspace during daylight hours within 25 nautical miles of your departure aerodrome. Fly further in uncontrolled airspace with an additional navigation endorsement. Take a passenger when endorsed to do so. Fly in good weather conditions (VMC). No medicals are required to fly an RA-Aus aeroplane so long as you are fit to drive a motor vehicle. Part of your licence fee includes limited cover for public liability insurance. Fly aircraft with more than two seats up to 1500 kg take-off weight and additional passengers if you hold a Class 2 medical. Fly aerobatics (extra training required). Fly at night (with extra training beyond the PPL). Fly on instruments/in cloud (with a lot of extra training). I expected Greg to put me through the mill; he’s known in the field as a ‘tough but fair’ examiner, with a real focus on ‘seat of your pants’ flying. I wasn’t, however, prepared for what came next. Here are a few words you never want to hear from your instructor: ‘fire!’ is one of them. ‘I don’t want to alarm you’ is a third. Of course, at first it didn’t register. I thought, ‘he’s going to retard the throttle to idle’. But, no, blow me down, he reaches over to the ignition and turns the engine off! No further power available. You haven’t heard silence until you’re 1800 feet above the ground without an engine. The silence was, impossibly, deafening. After several seconds of shock, the training I’d been given kicked in and I adopted best-glide airspeed and reacquired the runway, determined not to let it out of my sight. We were probably no more than a mile or two from the strip. I established the silent Foxbat on base leg. I felt like I’d been drafted into a clandestine operation from a 1960s World War II movie. We were as quiet as a mouse. ‘Umm, what are you doing?’ asked Greg. ‘Lining up for base,’ I retorted. ‘You’re going to take a tail wind?’ he asked disapprovingly. And, he was right. I flew a circuit and just kept on going … I even had to slip a little bit off at the end. With the engine restarted, I flew a few more circuits (demonstrating my side-slipping prowess) before coming to a full-stop. I have to say that the engine-off experience (our own little version of Silent Running) was probably the most instructive and useful exercise I’ve ever undergone. If I’m unlucky enough to have a complete engine failure in flight, I will now be completely confident of being able to land without panic … and without being too unnerved by silence. While converting from GA is RA is a simple process, there are a multitude of differences between both the aircraft types and the category rules. A different attitude—not just from the instructors. With an initial 1400 fpm rate of climb in the Foxbat, the nose attitude is much steeper. It’s certainly not your rental C150 on a hot day! A different sound—the Rotax 912 is a four-cylinder, four-stroke with air-cooled cylinder barrels, but with liquid-cooled cylinder heads, capacitor discharge ignition (CDI) and integral alternators, which turns much faster (yet much more quietly) than the Lycomings and Continentals of GA.
A different walk-around—while each type of any class of aircraft demands a specific walk-around, a composite aircraft also requires careful checks for cracks. Once flying though and going downwind, the absence of mixture and carby heat makes the downwind checks shorter. A different envelope—the Foxbat stalls at a glacial 26 kt; slow flight can be elegantly conducted at 35 kt and yet the approach speed is relatively similar to a 152. 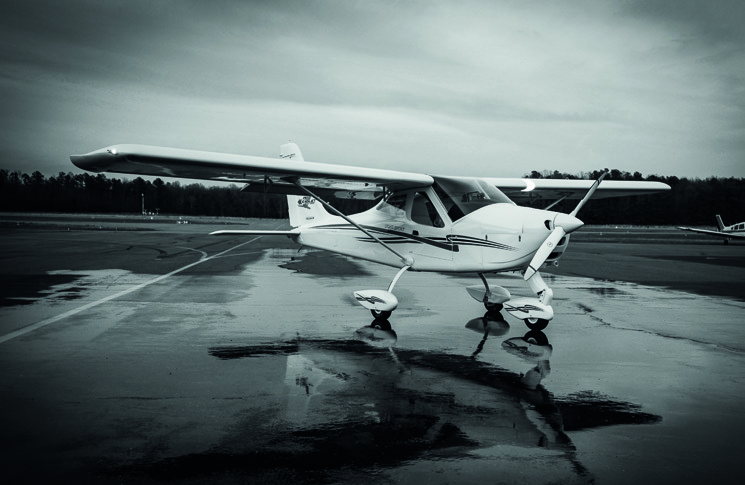 This can be used to great advantage, because the margin between the stall and the approach speed allows for extended side-slipping and s-bend turns that would make a Cessna instructor grip their seat and sweat profusely. A different test—the conversion required no theory exams, and the flight test was much shorter. Having said that, though, the different regulations give examiners almost unlimited scope for surprises (see The test, previously). The same airmanship—whether you’re flying a Foxbat or a Bonanza, you must still be diligent in looking out for traffic, use sound judgment in assessing weather conditions, fly VFR only in VMC, use the radio properly, observe airspace restrictions, pay attention to aircraft loading, routes, altitudes and fuel. Perhaps most important in both categories, is to understand the limitations that apply to the aircraft and its pilot. Yup much enjoyed the reading.. Excellent article. And yes, there is a whole new world out there that you will never find out about at a regular GA flying school. Excellent article which acknowledges that flying RA-Aus aircraft is real Stick & Rudder flying.